There's a reason Sanibel and Captiva Islands are consistently rated as one the best family vacation spots in Florida. It's an old-school kind of paradise, where simple activities like riding bikes, hunting for seashells on 15 miles of white sand beaches, and eating ice cream are everyone's favorite things to do. Life moves at a slower pace on the islands - much slower than busy Ft. Myers just over the causeway, or even Naples further south. The same two-lane road gets you both on and off the island so to avoid traffic, the quickest way to get around is the 22 miles of bike paths. It's hard to imagine this kind of family vacation still exists until you're here. When it comes to Sanibel Island accommodations, families have a variety of choices from luxury resorts and high-end hotels to smaller Inns and motels. Sanibel Island vacation rentals are also plentiful. But some of our favorite places to stay are the quaint seaside cottages where kids can run around and explore, parents can chill out, and everyone in the family is on island time. Cottages go together with Sanibel like sand and saltwater, or rum drinks and tiny umbrellas. A natural fit. 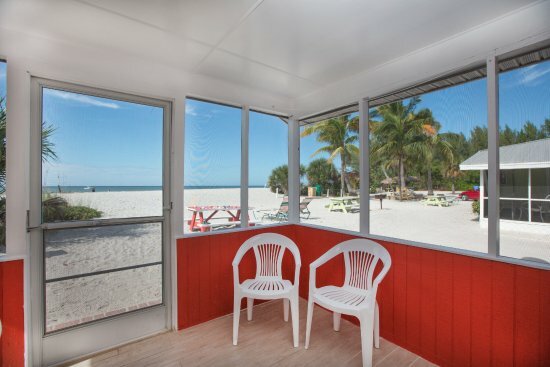 So if you’ve been thinking about a tropical southwest Florida beach vacation and want a unique place to stay, here are our favorite picks for Sanibel Island cottages. The cute, pastel-colored Gulf Breeze Cottages just a 3-minute walk to the beach are comfy and adorable, but we really love the range of accommodations they offer here: efficiencies, one and two bedroom cottages, two/three bedroom duplex cottages, and a three bedroom Beach House for the ultimate beach cottage getaway. Their weekly rates are also family-friendly, so if you time it right during certain times of the year, your large family or group of 6-8 can sleep comfortably for around $2,500 for the week. 1081 Shell Basket Lane, Sanibel, Florida. Check rates and availability. 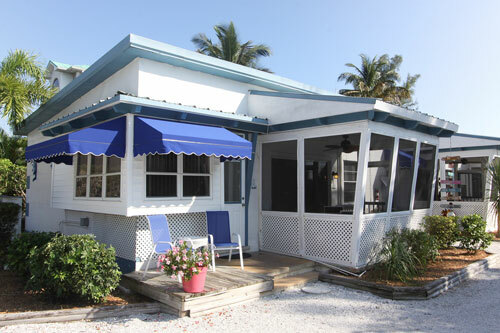 Beachview Cottages are a favorite for good reason - they're the quintessential throwback to yesteryear Florida vacations. The gumdrop-colored cottages are steps from the sand with screened porches, and there's a nice private heated pool. The mid-island location is close to great restaurants, shopping, and some of the best beach bars on Sanibel. Some of the cottages are even pet-friendly (some breed restrictions apply) so you can bring the whole family! 3325 W Gulf Dr, Sanibel, Florida. Check rates and more details. Shalimar Cottages lies mid-island on the "belly of the dolphin" (if you can picture the shape of Sanibel as a dolphin swimming toward Ft. Myers Beach). There are 13 air conditioned/heated cottages with fully equipped kitchens and a beautiful beachfront location. Take a look at your morning view! 2823 West Gulf Drive, Sanibel, Florida. Search rates and availability. The bright and colorful cottages at Castaways Cottages is another favorite because of its two great locations. The front of the property is just steps from Blind Pass Beach - a great place for shelling - while the opposite side of the property is a quiet back bay location across the road that’s perfect for for boating, fishing, kayaking, paddleboard and being in nature. It's also steps from one of the best restaurants on the island, The Mad Hatter. Everything you want or need is right here with a Key West look and an islandy vibe, 6460 Sanibel Captiva Rd, Sanibel, Florida. Check details and availability. 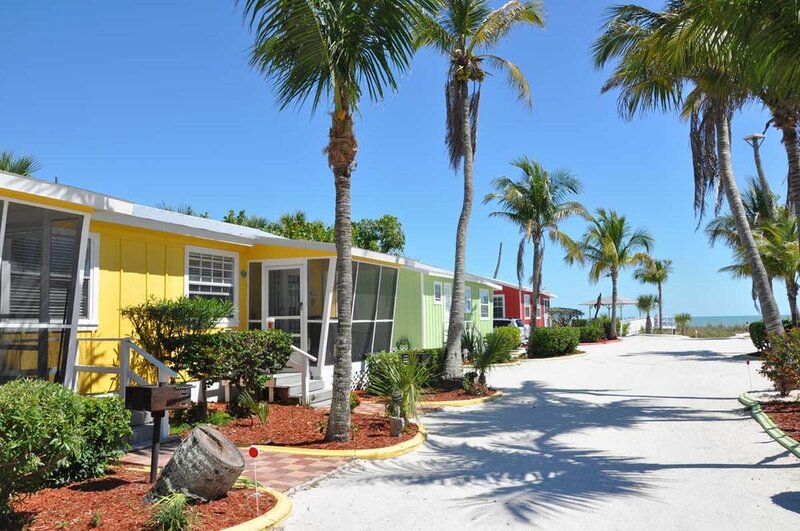 The idyllic Tropical Winds cottages sit on Sanibel's west end, directly on the Gulf of Mexico, in a private and small residential neighborhood. We especially love that they're so close to J.N. "Ding" Darling Wildlife Preserve - it's just across the main Sanibel-Captiva road. There are ten cottages - four 1 & 2 bedroom cottages are on the beach, and six duplex cottages with a bit more room are just steps away. 4819 Tradewinds & Jamaica Drive, Sanibel, Florida. Search rates and details. 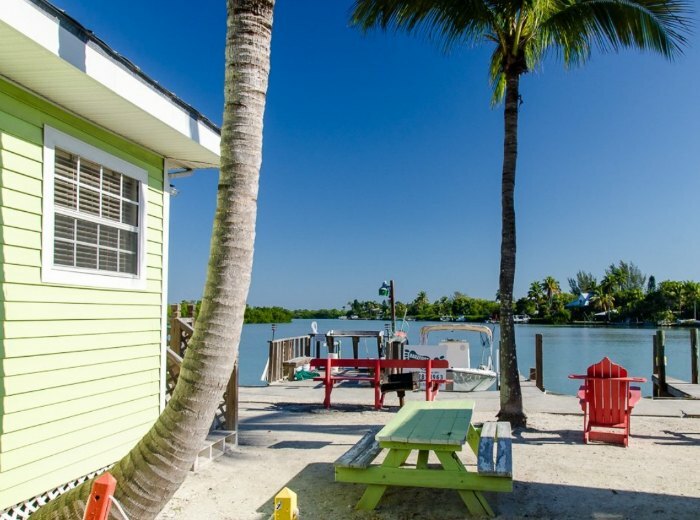 Seahorse Cottages are located on a quiet part of Sanibel toward the Lighthouse, near San Carlos Bay. Guests will love the complimentary bicycles, sand chairs & beach towels, hammocks, a secluded small heated pool, and outdoor gas and charcoal grills. 1223 Buttonwood Lane, Sanibel, Florida. Search rates and availability.